Find peace and tranquillity amongst the dramatic scenery and beautiful beaches of Phuket. 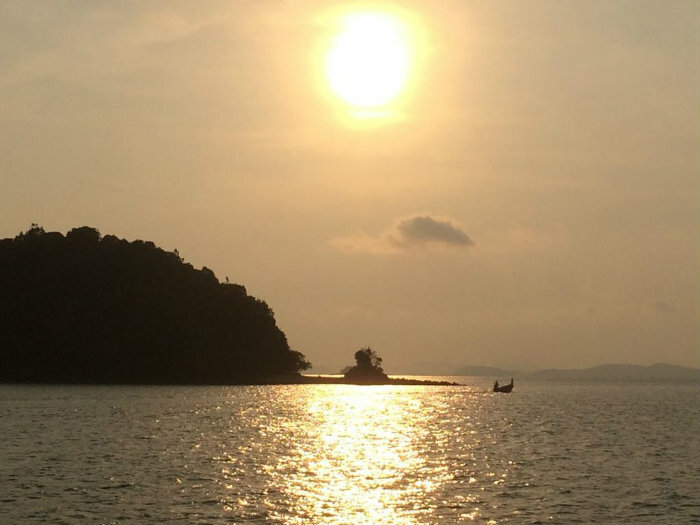 Lying just 8° north of the Equator, Phuket is a wonderful sailing area in the Andaman Sea. 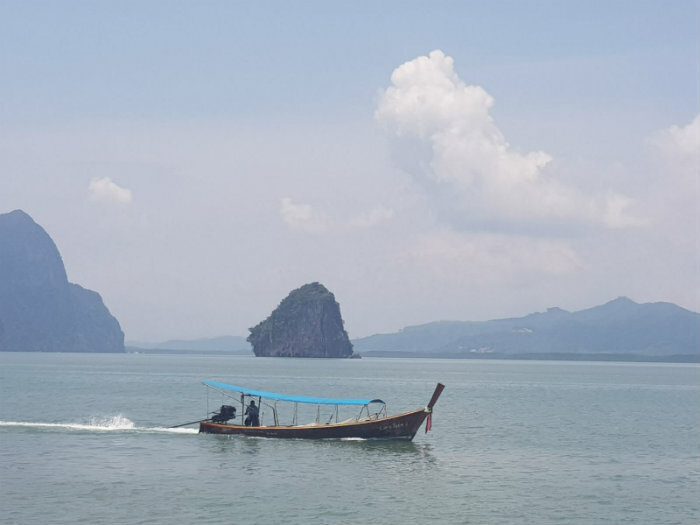 Phang Nga Bay lies between the island of Phuket and the mainland of Thailand and is a protected, very dramatic sailing area, with a fantastic gallery of giant limestone sculptures rising out of emerald waters. With 42 islands in Phang Nga Bay, there are many miles of beaches, creeks and anchorages. 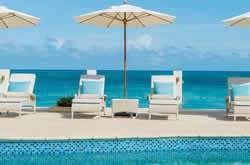 The beaches are palm fringed, with pristine white sand and crystal waters. The snorkelling is exceptional, with stunning coral reefs to explore. You may find yourself being escorted by some of the local dolphins, if you are lucky. Add to that the renowned friendliness of the Thai people, their magnificent cuisine and culture and Phuket has deservedly become South-east Asia’s premier sailing destination and home to the Phuket Race Week, King's Cup Regatta and several marinas. Fantastic snorkelling-you could even see Whale Shark! Embark at Phuket Yacht Haven Marina in the North East of Phuket. Sail into the majestic and magical Phang Nga Bay with limestone cliffs and islands offering spectacular views. Visit James Bond Island, the location for the film “The Man with the Golden Gun”, and anchor at Koh Yang. Or visit Sea Gypsy Village at Koh Panyi (12nm), set on stilts over the water. Swim at the fascinating Koh Hong Island, named for its large internal lagoon, and visit Panak Island. Continue sailing to Krabi, another great sightseeing destination, ideal for swimming and relaxing on beautiful beaches. Anchor for the night at Ao Nang Beach and go ashore for shopping. Sail to Phi Phi Islands, renowned as paradise islands. Discover the magical landscape of Maya Bay where you can enjoy snorkelling on colourful coral reefs in emerald sea. The movie “The Beach” was filmed here. South of Phuket, these islands are best known as excellent diving and snorkelling destinations. Racha Yai has a strip of fine white sand tucked deep into the long bay, called Ao Tawan Tok or Ao Bungalow. Racha Noi is uninhabited but there is some great diving in the area. A hidden gem with superb shallow snorkelling. Good anchorages on Koh Yao Yai opposite this island. We arrived at the office of Dream Yacht Charter at Yacht Haven Marina where we met the lovely base manager, Joel. We settled the money for the cash box - €160 per person (includes national park fees, tourist taxes, mooring fees etc) and the optional €95 per person for excursions. We arrived early at the base so left our luggage at the marina office and went to the swimming pool and had some lunch. We returned to the office for our embarkation at 17:00 and received a safety briefing and an explanation of the program. We departed Yacht Haven Marina at 18:00 and motored to Ko Wa Yai (1hr 30m) where we anchored offshore for the evening. We had dinner on board whilst enjoying the view of the beach, fringed with palm trees. After breakfast we had a brief discussion on the activities for the day and set off to Koh Hong. 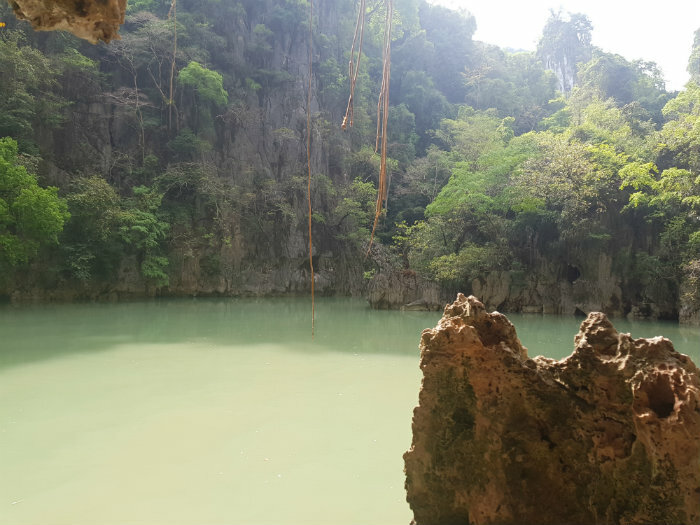 There we found a beautiful lagoon which is only accessible by tender through a cave, leading you to a lake encircled by a 100m cliff. After some exploration we headed back for lunch on the boat. 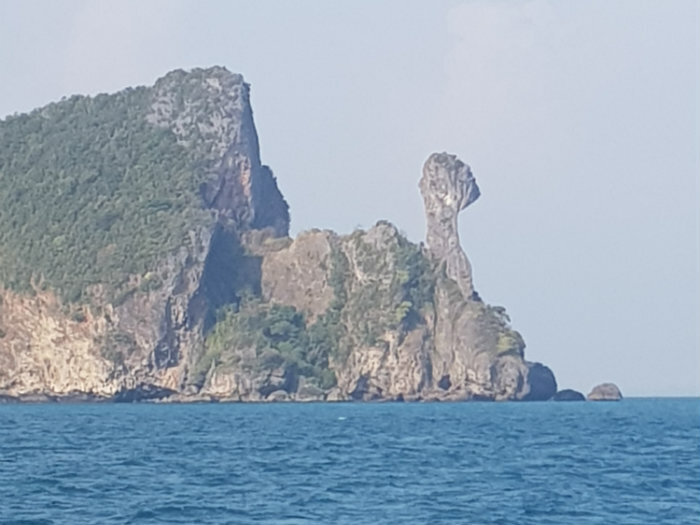 In the afternoon we went by long tail boat to Koh Ping Kan, better known as “James Bond Island”, where they filmed “The Man with the Golden Gun”. We also visited Koh Panyee, a floating village where over a hundred fishermen and their families live. The rest of the day was spent swimming and snorkelling before motoring to Koh Chong-Lat for the night. 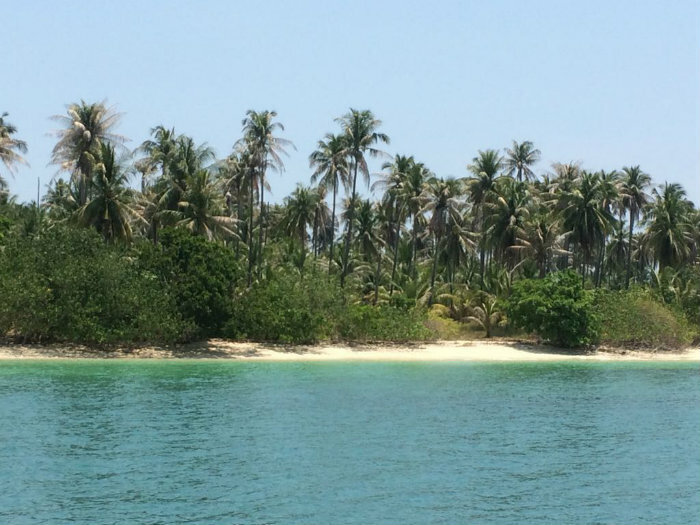 We left Koh Chong-Lat and motored to Koh Thon where we were collected by a long tail boat at 10am to take us to our kayaking trip. We kayaked for two hours exploring beautiful mangroves, lagoons and spotting monkeys and exotic birds. After our trip we spent the afternoon snorkelling and swimming off the boat. Later that afternoon we made our way to Koh Pak Bia Island, considered one of the best snorkelling spots. We woke up early to see the breathtaking sunrise. After a very relaxed morning we sailed to Koh Dam Kai, or “Chicken Island”, where we swam and snorkelled in a real aquarium and a sheltered beach. At low tide you can also walk across the sand bar to Koh Tup. Dinner on board and night spent at anchor. After breakfast we left Koh Dam Kai and motored to Krabi to get the minibus which took us to our two hour Elephant Trek followed by a Thai massage at the Raclaron Spa. After the excursions we explored Krabi with its many cafes, restaurants and tourist shops. Krabi is a great place to pick up any provisionings that you might want as there is a large supermarket. Back on the boat we made our way to Koh Main Phai (Bamboo Island), stopping at Yongskem Bay (Monkey Bay) before anchoring at Loh Lanah Bay for dinner and night at anchor. We spent the morning at Loh Lanah Bay kayaking and swimming. After lunch we made our way to Koh Phi Phi Le. 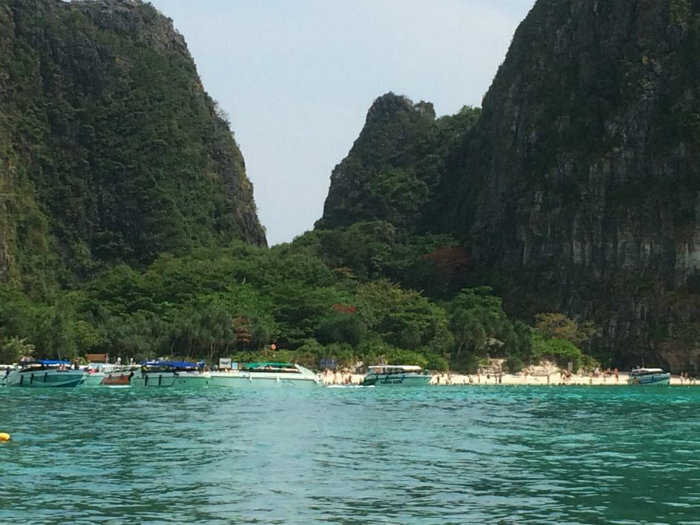 From here you can visit Maya Bay, made famous by the film “The Beach” starring Leonardo Di Caprio. 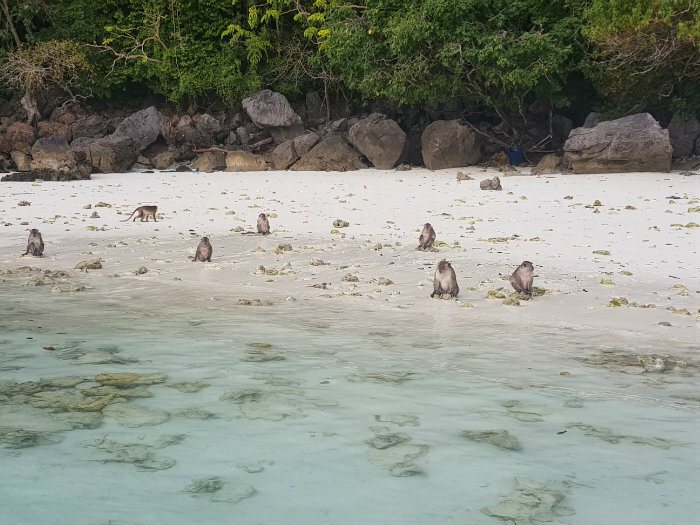 **Maya Bay has now been indefinitely closed to visitors in order to try and restore the ecosystem that has been damaged by tourism. ** We dinghied around the island and discovered cliffs and caves where swallows nests are harvested before being exported at very high prices to China. After dinner we went ashore at Koh Phi Phi Don to enjoy fire shows and the lively atmosphere. There is no shortage of bars with great music if you fancy a party! We left Koh Phi Phi Don very early as we had a long sail back to Phuket. We anchored at Koh Kai Nai, a small island with beautiful white sand beach, for lunch and a swim before carrying on to Koh Lawa where we spent the night. A nice early breakfast whilst en route back to Yacht Haven Marina for disembarkation by 09:00. We relaxed at the marina before taking our transfer back to the airport. A very special week, filled with new experiences, culture, beautiful nature and amazing snorkelling. 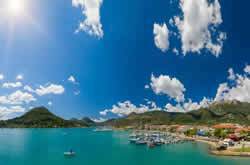 The vast amount of islands in this area make for a fantastic sailing holiday! 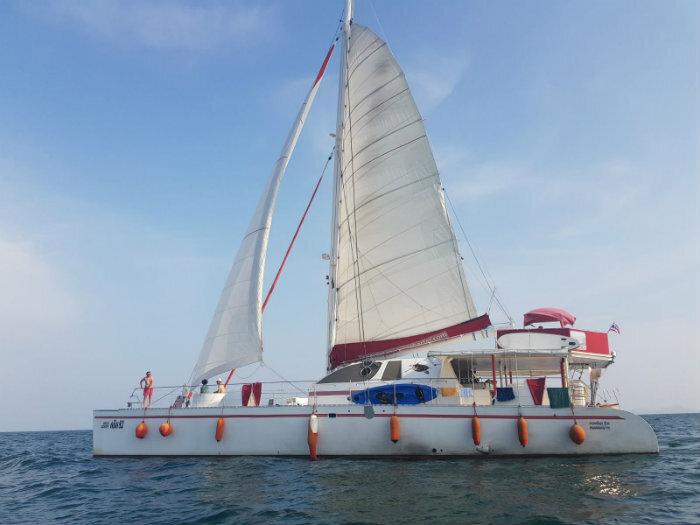 Best time to travel to Phuket is during the cool NE monsoon season from November to March when the weather is sunny and dry with calm seas, though the NE winds are ideal for sailing and keeps things comfortable. The temperatures range from 24-32°C. The hottest time is from April to May with temperatures 27-36°C and a lack of wind makes it feel very humid. From June through to August, the SW winds pick up, though sailing is still sheltered in most of the cruising area. Brief but heavy showers but the area is less crowded. During September and October there are heavy rains. British Airways and Thai Airways have direct flights to Bangkok. Thai Airways have daily flights to Phuket. We recommend all clients pre-book transfers from the airport to the base. We can arrange these transfers for you with the base in Phuket. A transfer from Phuket airport to Yacht Haven marina takes approximately 20 minutes. 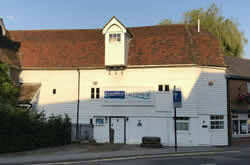 Please ask a member of staff for pricing. "First class service from Nautilus. 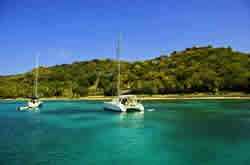 On arrival our catamaran was clean and serviceable and the help given by the base staff was excellent. "